Micromax has launched the upgraded version of its much sold phablet Canvas 2, dubbed as Canvas 2 Plus A110Q, this device comes with features for better performance and usability. Many of the specs haven't been changed but a major upgrade has been done to the processor which is now a quad-core processor that is same as in Canvas HD. It has a 5" display with 854 x 480 resolution, which seems low. It runs the latest Android 4.2 Jelly Bean and has Mediatek MT6589 1.2 GHz quad-core processor with 1 GB of RAM and 4 GB internal memory an can be expanded upto 32 GB. 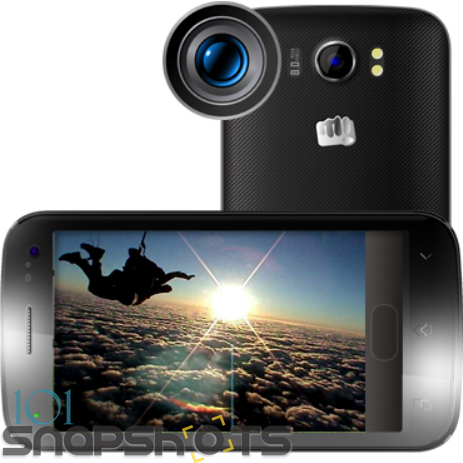 It has 8 MP camera that can shoot 720p videos and has dual-LED flash for low light imaging and a front 2 MP camera. It supports 3G, Wi-Fi, micro USB, 3.5mm jack, Bluetooth 4 and GPS. It is powered by 2000 mAh battery that gives 6 hrs of talktime. Being priced at Rs. 12,100, the device comes with an upgrade of processor, RAM and OS but the screen resolution disappoints. None the less, it is a good buy considering its previous model's glory. It would not be wrong if 2012 is called the year of Android devices, because this was the year when a large number of android powered devices were launched by some Indian which had features to compete with high end devices. This all created a chaos and confused the buyer that which phone he needs to buy. Don't worry, we have come up with a list of Android phones to suit every budget. On the foot steps of the launch event of Samsung Galaxy S4 in India, I got a chance to put my hands on to the flagship device. The device has almost same dimensions as seen on Galaxy S3, despite the fact that the display is a bit larger than the S3. The Karbonn A5+ is an upgraded version of Karbonn A5 and the only difference as compared to its predecessor is that the A5+ comes powered by 1GHz processor and with a 3MP rear camera. The A5+ is also cheaper than the A5 handset. iBall Andi 4.5h sports a 4.5 inch screen with qHD resolution. It is powered by a dual core processor running ICS OS with 1GB RAM. The handset is priced at around Rs. 12,300. ©2012-2013 101 Phones India. All Rights Reserved.